Yesterday, as I was searching for information of the crooked banker of yesteryear, Max Garfunkel, of the firm of Garfunkel and Tauster, I kept turning up information about another Max Garfunkel. This Garfunkel was quite the opposite type. He was a classic, hard-working, honest, immigrant entrepreneur. For some years in the early part of the 20th century, this Max Garfunkel was a well-known figure. He was the owner of the Busy Bee Restaurants, an early local chain of lunch counters around New York. The chain was well known enough in the 1910s for the New York Times to refer to it in articles without explanation. Max Garfunkel sailed from Kishivev, Moldova, to New York in 1888, with fifty cents in his pocket. He was 13 at the time. According to his son Louis, who later wrote a book about running diners, Max simply announced to his family one day that he was going to America—alone—and that was that. He spent his first night in this country sleeping in an empty open wagon on the New York waterfront not far from where he had been put ashore from Ellis Island. The next day, he roamed the lower part of Manhattan seeking work, and before nightfall had a job in a saloon and a home with the old German owner. He saved his money ($7,000 in all, a massive sum at the time) and, in 1893, started his first restaurant at 3 Ann Street, at the corner of Broadway, just yards from City Hall and all the Park Row newspapers. (That's the basic intersection, above.) Sandwiches, coffee and pie were all two cents. Max held to those prices for 20 years. 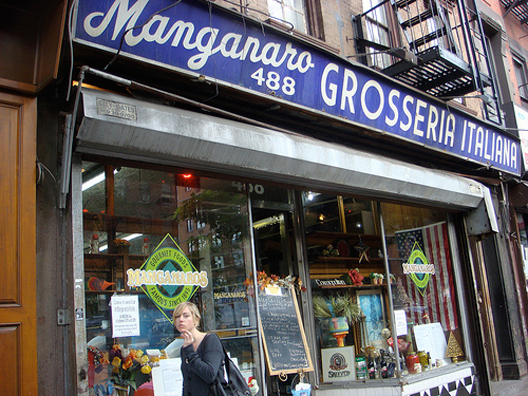 I passed by Manganaro Grosseria Italiana just last week, and almost went in for a sandwich. But didn't. Thus ends a 121-year run. Here's an account of a visit I paid last year about this time. I was walking down the lower stretch of Clinton Street on the Lower East Side when I gave 67 Clinton a once over and noticed its interesting cornice pronouncement: Garfunkel & Tauster Building. Who they? They were private bankers, and Garfunkel & Tauster—not the most euphonious business name on record—was a banking firm. Max Garfunkel and Marcus Tauster were their principals. They went into business in 1919. By 1924, they were bankrupts, criminals and fugitives. Garfunkel and Tauster were indicted for making false statements to the State Superintendent of banks before the failure of their bank. Garfunkel pleaded guilty and took a term of six months to three years. Tauster, however, fled with his wife and kids. He was found in October 1924 in North Bay, Ontario, posing as drygoods salesman Max Bauman. He was extradited and sentenced to two to four years in Sing Sing. The real estate company that now owns 67 Clinton has cheekily taken on the building's name, calling itself the Garfunkel & Tauster Corp. I wonder if they are aware of their predecessors' business legacy. 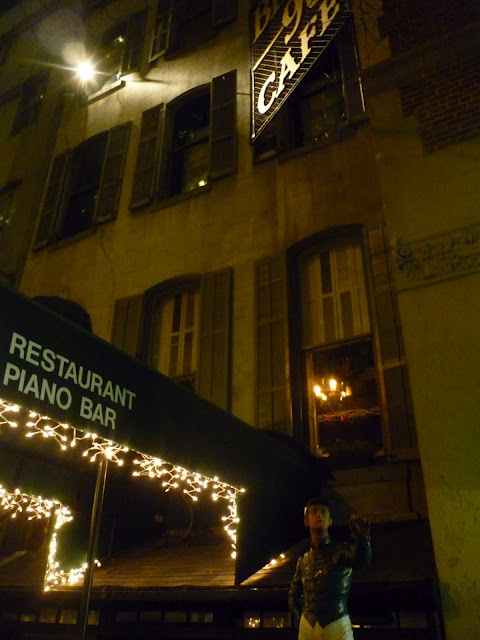 This blog has occasionally reminisced about Steak Row, the gone-forever strip of utterly male, red-meat-and-strong-booze eateries that once lined East 45th Street between Lexington and First Avenue in Manhattan. They had names like the Pen and Pencil, The Editorial, and Danny's Hideaway. They were—it would seem obvious—favored by journalists and magazine people, as well as a smattering of celebrities. Because of my posts, I occasionally get an odd e-mail from some odd Steak Row habitue taking a tour down memory lane. (I have made contact with the son of the owner of the Pen and Pencil this way.) Recently, a former customer of The Press Box contracted me, looking for information on the year and reason why the restaurant closed. 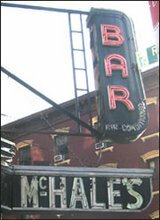 The Press Box, at 139 E. 45th, was run by Henry Castello and Harry Storm, both former Pen and Pencil bartenders, along with former Voisin waiter captain Fred O. Manfredi. By 1973, it was owned by Michael Wayne. Max Klimavicius, one of the current owners of Sardi's, began his restaurant career at a dishwasher at The Press Box. Unlike many of former mainstays that once help the Steak Row chow houses, the Press Box building still exists. It's a Chinese restaurant today. I had little help to offer this reader, but he shared a number of scintillating details with me. The place seems to have been rather rakish, in a "Mad Men" sort of way. This eye-witness said the staff used to hand out "press cards," which permitted ladies to visit the men's room. What the women did when they went there is left up to our imagination. More unbelievable is what the women would see when they got there. According to the source, the urinals were affixed with magnifying shaving mirrors which hung at about waist level. This, I guess, ensured that every booze-soaked newshound left the loo feeling like a big man. 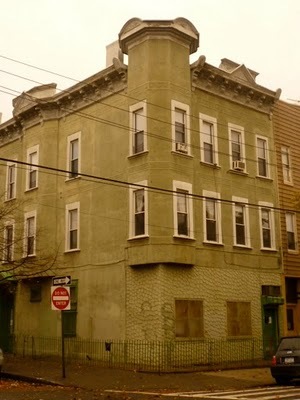 Two years ago, I blogged about this intriguing Ridgewood building at the corner of Onderdonk and Stockholm. I noted the odd color, the odd structure, and the presence, up top, of a number of Jewish stars and four-leaf clovers. I speculated that it was a religious building in the past, but find no evidence of such a past. At the time, there was garment work going on inside. Recently, a reader wrote in, saying: "Green Mystery; Renovated our home (200 feet away). Found in ceiling on 2nd floor a green bottle with the Star of David. Could the building have been a brewery? Still have the bottle but can't make out all the initals; small b, large N over an A followed by Co."
Interesting. Anybody out there have a clue. I still can't find out anything about this building. UPDATE: Commenter "Mingusal" sheds some light on the mystery below by reminded us of the six-pointed star's other symbolic past. Do we have a former German beer hall here? I originally thought this New York Times story took place in the East Village. As several sharp-eyed readers informed me, it actually took place in Brooklyn. Still, it's a great story. So here it is in the right context. A small boy with very red hair ran up to Patrolman Arthur Engh at 4 o'clock yesterday afternoon at Second Avenue and Eighth Street in Brooklyn. His eyes were wide with fright and his red hair stood on end. "There's a bear in a house up the street," he gasped. "He's eating everybody up." "Tut, tut," said Patrolman Engh. "You're twenty-five days late. Roll your hoop." Patrolman Engh raced for a telephone. In due time, with clatter and shriek, Emergency Squad 13, headed by Sergeant Hugh McGuire, rolled up in front of a tiny, two-story frame dwelling at 84 Second Avenue where Emil Shubert Jr. was leaning out the window, shouting for help. "There's a bear in the hall," he bellowed. "A great brown bear big as a buffalo. Help!" It was all true. The invader was a real, 500-pound bear that had broken out of its pen in the backyard of the home of Richard Herrold, pet-shop man at 121 Ninth Street, which is just back of the Shubert's back yard. The bear ate up the Shubert's butter, milk and chicken, and resisted all attempted to be lassoed and captured. The cops tried to lead him out with a trail of "sweet crackers," which finally worked, the bear led out of the house and back into its cage. The animal "belonged to a Coney Island show and was left with [Herrold] to board." None of the houses where this took place exist today. The area is all low-lying warehouses. 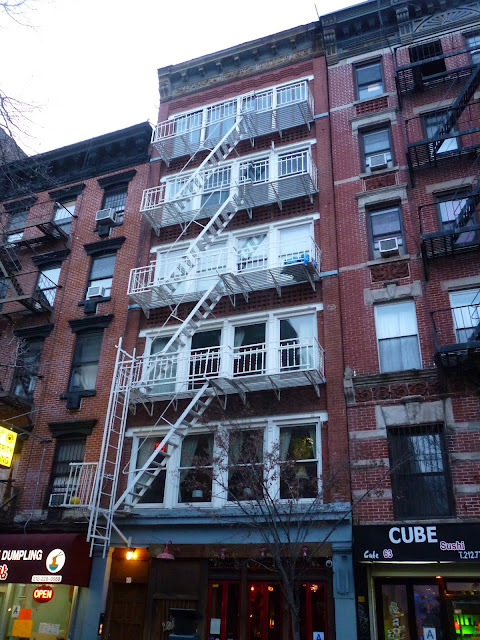 This is 84 Second Avenue in the East Village. I've always liked this building, mainly because it's one of those old-fashioned, two-story, glass storefronts that were once so common and are now increasingly rare. But also because it's never been renovated or gentrified (indeed, it hasn't been occupied by a going business in some time), and is thus very redolent of the area's workaday, immigrant, un-hip past. I was curious was sort of businesses had inhabited the old place. I became curiouser when I spotted this incomplete name in riles just outside the left-hand door. The wacky tropical font on this hair salon sign makes me think it used to be a tiki bar name Timbuktu. 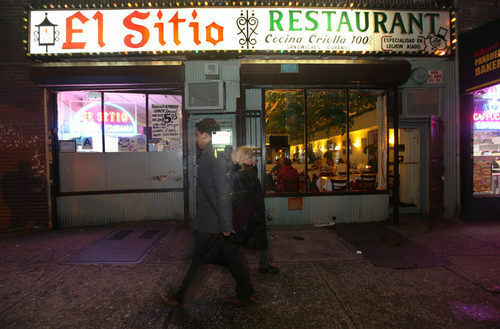 I was frustrated in trying to learn the backstory of El Sitio, a longstanding Cuban restaurant in Woodside. I could not discover the name of the founder, or if the place was still in the same family, or had changed hands. Hey, it's hard detective work when everyone speaks Spanish and you don't. I suspect many writers before me had the same experience, because whenever a reporter writes up this place, all they basically do is say "great Cuban sandwich" and leave it at that. No mention of the joint's history. No quote from the owner. Anyone out there have more solid information on El Sitio? Anyone ever go there in the 1960s or 1970s? There aren't many Cuban food choices in New York. So whenever one of the dailies decides to do a piece on the state of Cuban food in the city, you can sure a reporter will take ride on the 7 train to this Woodside outpost under the subway tracks on dirty, dusty Roosevelt Avenue. El Sitio has been here about a half a century. It's founding dates to the 1960s, when there was a great influx of Cubans to America. It doesn't look like the joint has changed much in that half century. The restaurant is divided into two parts. As you enter, there's a short, six-stool luncheonette counter of orange formica. Regulars tend to stop here, either to order, chat or just linger. Somewhat hilariously, there's a small, sparsely stocked bar behind the counter, in case you want a Johnnie Walker Black with your ropa vieja. If you're interested in a more formal experience, there's a no-frills, dimly lit dining room with small tables and tablecloths under plastic. The expected pictures of Havana are on the walls. And unexpected terrariums filled with sad-looking plants are fitted like windows into the wall dividing the two rooms. The clientele here is primarily local and largely Latino. The menu is in Spanish and English, but the Spanish comes first. The version of the menu posted above the counter is only in Spanish. Most people come here for the Cubano sandwich, and it is justly famous, made with care and with wonderfully crispy bread. The flavors are fulsome, yet delicate. But I found the ham croquettes and red beans also excellent. The prices are ridiculously cheap. Those sandwiches are under five dollars. El Sitio does a decent trade in take out. But if a customer is under the impression that he'll be in and out quickly, he's soon put straight. Making the sandwiches is a 10-15-minute process, and the woman monitoring the sandwich press, lovingly basting the bread and meats in butter, isn't going to rush it. That seems to be fine with most of the lunchers, few of whom seem to be in a hurry to get anywhere. 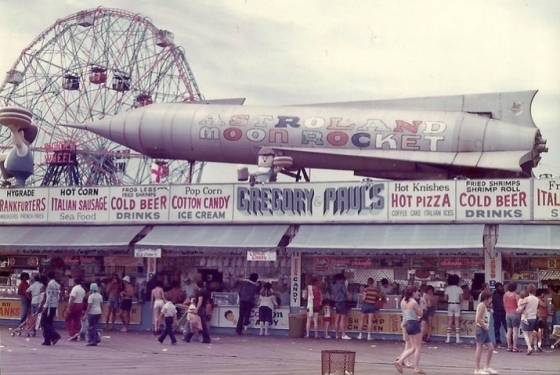 Ravaged Coney Island doesn't have many landmark businesses left standing. You can count them on a couple hands. I thought I knew them all. Then I walked by Friscia Pharmacy on Mermaid Avenue. 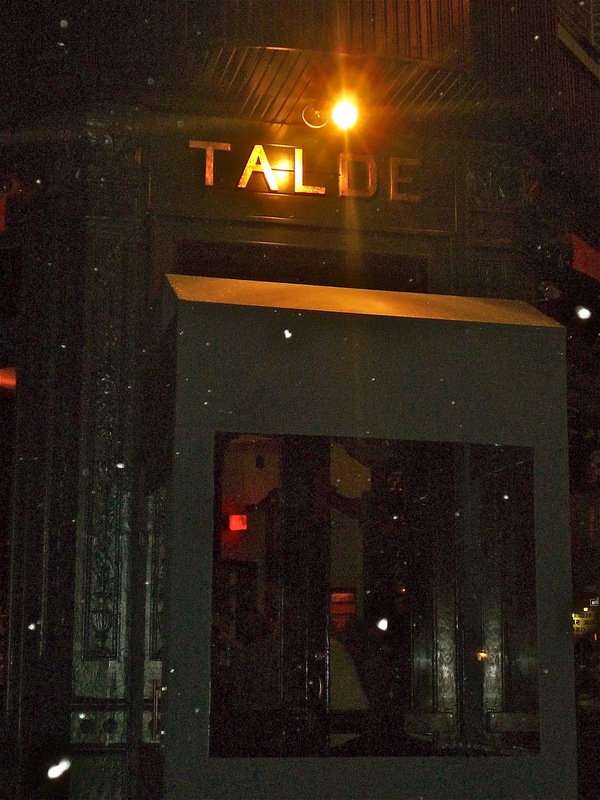 I had a meal recently at a newish Park Slope eatery named Talde. The food was good. But what really caught my attention was the woodwork surrounding the bar, lining the windows and demarcating the partition between the barroom and the dining area. So ornate and particular and exotic. It seems too well-crafted to be new. Could it be a reclaimed relic? 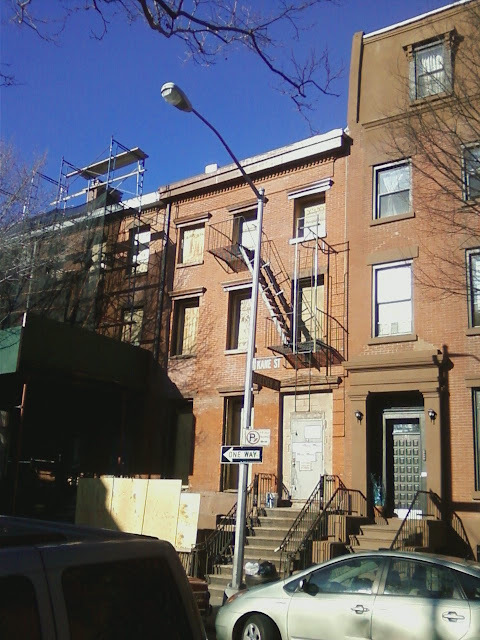 For the first time in nearly three years—since the infamously derelict Cobble Hill building was declared a menace by the City, boarded up and surrounded by scaffolding—the Rat-Squirrel house can be seen. The scaffold was taken down recently. And the facade, which has been worked on steadily over the past six months, doesn't look bad at all. Still needs a door and glass in the windows, but the cornice work looks pretty decent. Grub Street reports that the new owner of the East Village space that used to contain the late, lamented Holiday Cocktail Lounge is Robert Ehrlich, CEO of Pirate Brands. You know, Pirate Booty, and all those supposedly healthy snacks parents refer to as "kiddie crack." He plans to transfer Holiday's liquor license to a new restaurant-bar, expected to open in April. "The restaurant will serve local, regional foods. The first-floor spot, previously owned by Jeff Tendler, will be managed by Barbara Sibley, owner and chef of La Palapa, the Mexican restaurant right next door. Sibley told Grub Street, 'We're going to try to preserve as much of the history as possible.'" Will the semi-circle bar be kept? The phone booth? No name has been given to the new place yet. I have a suggestion: Holiday Cocktail Lounge. 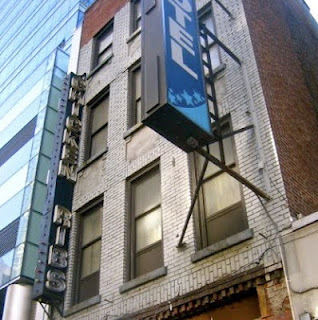 JVNY reports the sad news that the old fleatrap The Elk Hotel, on 42nd Street and Eighth, has closed for good. It wasn't a landmark (though it was old, having been built in 1925). It's wasn't architecturally interesting. No famous novel was written inside its walls. 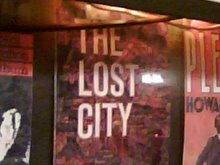 But it was a living sign that heterogeneity lived on in Times Square; that people from all walks of life could still find a place to call their own in the busy center of Manhattan; that you didn't need to be rich or corporate or a tourist to find a room to call your own. Yes, I know it was home to many a druggie and call girl. So what? 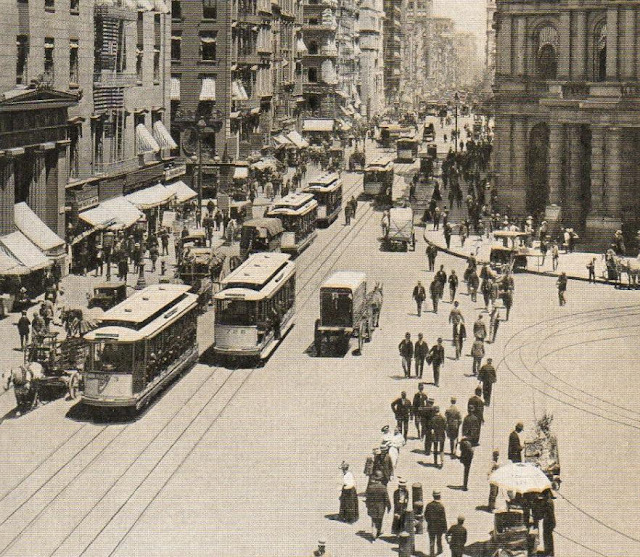 Is it any use pretended that those types don't walk our streets, and won't always be a presence in a city like New York? They've got to go somewhere. And, quite frankly, I'd rather hang out with them than that guy who made the decision to put a Red Lobster near the Crossroads of the World. 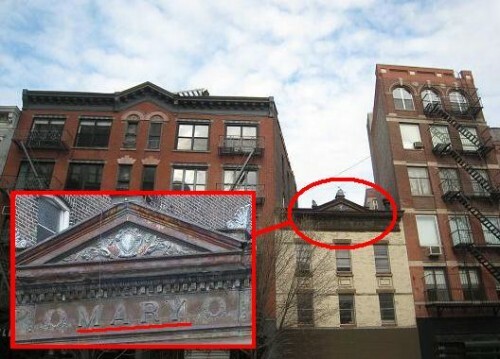 Years ago—back in April 2008—I wrote about a little SoHo building from the 1860s that fell to the wrecking ball to make way for the swank Crosby Street Hotel. It was a sweet little thing. At the time I described it as "just the sort of small, understated, graceful, ancient, irreplaceable building New York is losing by the dozens." My supposition proved correct. The building was owned by one Charles J. Ursitti, a billiards historian who lives in Florida. Yes, a billiards historian. Today, I received a message from Charles' cousin. He saw my post, and asked Charles about "Mary." "He said it was the builder's wife from the 1800's," reported the cousin. How unspeakably sweet. I miss the cornice even more now. 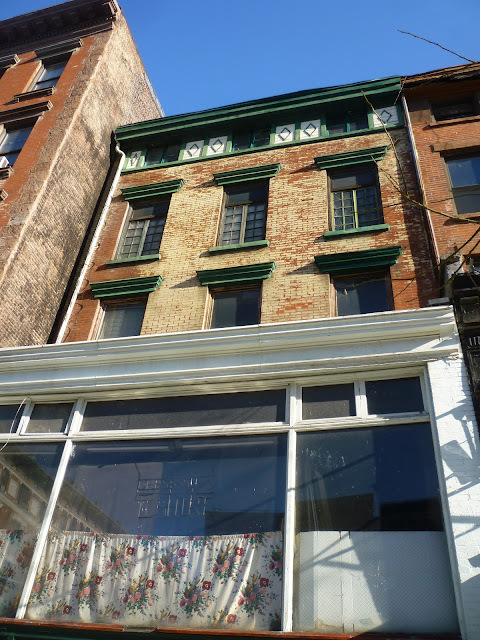 The Strangest Building in the East Village—Still Strange, But Looking Great! The Strangest Building in the East Village has gotten a makeover. Back in 2008, I told the odd history 62 E. 4th Street, how it came to possess its odd figure in 1889, first as a two-story affair, then five stories, and how it thereafter went through tenures as a meeting hall, a German music hall, Astoria Hall, Manhattan Lyceum, the Astor Ballroom, a gay cinema, a hang out for Andy Warhol and Jim Carroll, and a performance space. The picture above showed how the old girl was faring in 2008: plywood, rust and decay. 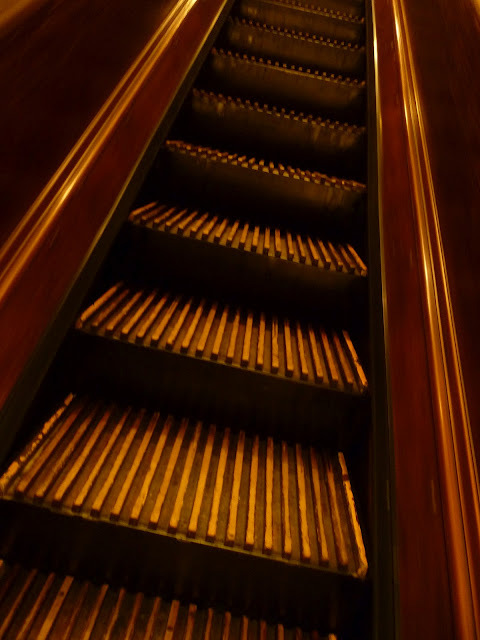 A few weeks ago, when I wrote a post bemoaning that Macy's Herald Square had removed their historic wooden escalators and replaced them with metal ones, a few sharp-eyed readers wrote it to say that the wooden ones remained in place on the upper floors of the store. So, the next time I went to Macy's, I took the long journey to the top. And they were right. The top two floors still have the classic escalators. And they look as great as ever. The escalators on the lower floors will supposed by returned to their rightful place after a renovation of the store is completed. The other day, when I was spending my final hours in the Holiday Cocktail Lounge, and found that their wooden phone booth phone still worked, I thought to myself, So, is this the last one? This blog has an obsession with phone booths. And over the past 18 months I have noticed that in very quick fashion the City's surviving phone booths have been going out of order, their dial tones taken away and often the very phone yanked out, even as the booth remains. And sometimes the booth goes too! I've gotten used to picking up a receiver in a phone booth and hearing nothing. It's become so it's starling when I do encounter a working phone. I'm sure there are other phone booths in the City that still work. 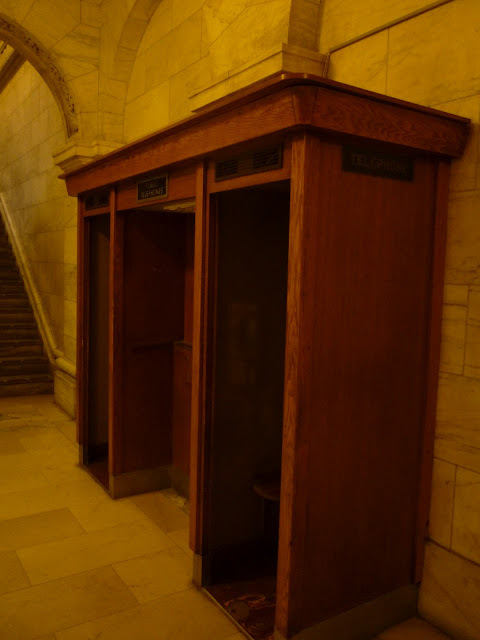 But if you were ask me right now where one was, the only ones I could think of are the several banks of phone booths you can find in the lower levels of the New York Public Library on Fifth Avenue. I do not know why the library has chosen to keep them going. Perhaps it's willing to pay the phone company the high fees it asks to keep phone booth in operation; something most businesses aren't willing to do. So I rode down to Coney Island the other day, got off the train, walked through the stylish subway terminal to the intersection of Surf and Stillwell, and I saw—this. What the hell is this totally nondescript, anonymous, uninteresting, gray-and-glass building doing on the southeast corner of Coney Island's most significant intersection? Oh, I see from the sign in the window: Thor Equities put it there! Thor, you'll remember, is the development corporation that has been systematically ripping out the heart and soul of Coney for the past few years, buying up land, tearing down great old buildings, kicking out Astroland and doing other wonderful, soul-killing things. This particular corner used to be the home of the Surf Hotel. It was a crummy little two-story thing, and had been left to rot for years. But it was utterly in keeping with Coney's character. This new structure is—well, how should be put it?—not. Over the years of doing the "Who Goes There?" column, I've learned there are two kinds of long-standing, unsung New York eateries. There are the kind have a faithful, stealth foodie fan base (Sarge's Deli, Villa Berulia, Liebman's Deli). When those restaurants are profiled, devotees crawl out of the woodwork and sing the joint's praises, or scold me for spoiled the anonymity of their city secret. And then there are those restaurants (El Viejo Yayo, Toledo, Tap & Grill) that have a faithful base made up of regular people, the kind of businesses considered too uncool or unremarkable to be taken up by any fanatical foodie contingent. Writing up Il Tinello, I knew it would fall into the later category. (I'll be surprised if the column garners two Eater comments by the end of the day.) It's the sort of dull, but dependable haven of fine dining that culls favor with conservative diners but doesn't provoke the curiosity of the hip and trendy. I can understand that. Il Tinello is not exactly exciting or distinctive. That said, my curiosity is raised by any joint that sticks around for 25 years. Older marrieds and old friends catching up—as well as a smattering of celebrities seeking solitude and solicitousness—add to the clientele. Owner Mario Fabris, who hovers around the small bar area, greets everyone as an old friend as their come through the door. It's all about tableside service at Il Tinello. You expect a place like this to have a dessert trolley. But an antipasto trolley? And there was not one, but two, fish specials that were filleted at table. Old school. Fabris eyed these delicate operations from the bar, sometimes swanning over to the action with a nervous, judging eye. What Il Tinello looked like for its first quarter century, I can not tell you. It recently underwent a four-month renovation. There are mirrors, there are oil paintings, there are wine cabinets. Nothing so visually interesting that it would distract you from your meal and conversation for long. The loyalty of a few regulars was not shaken by the brief interruption of service. Regis Philbin, one of the faithful, is still honored on the menu with a pasta dish. Would you want to eat something called Agnolotti All " Regis"? Well, you can if you want, and if you have $25. (Prices run high here.) Less celebrated is the Pasta All "Icahn." I asked my waiter if it was named after the corporate raider Carl Icahn. He said it was. Icahn is a habitué. 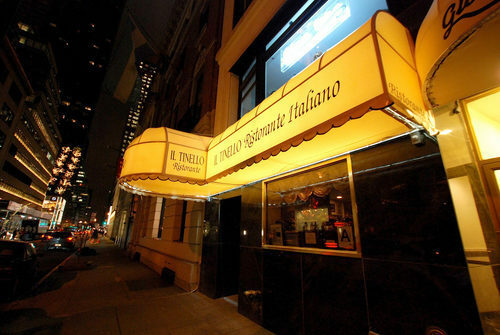 In fact, according to one article I read, the moneyman once tried to make a $10 million deal over a meal at Il Tinello. "He's coming tonight," the waiter added. Should I order Pasta All "Icahn," I asked. He scrunched up his face. "It's a simple dish. The special is much better." Labels: Il Tinello, who goes there? I've been lucky enough to visit New London, a down-on-it-luck maritime Connecticut city, a few times. Every time I walk the streets of its wonderfully preserved, 19th-century downtown, I make a point of darting down tiny Green Street and paying a call on Dutch Tavern. For my money, the Oak Room in the Algonquin Hotel was one of the most sophisticated spaces in all of New York. I felt like an absolute New Yorker there wherever I slipped behind a white-tableclothed table, my back to the paneled wall, tucked into my Martini and waited for the show to begin. No one every misbehaved in that room, and everyone dressed to the nines. Grace, politeness and ebullience reigned effortlessly. I saw many great artists there. Diana Krall, long before she became famous and musically uninteresting and Mrs. Elvis Costello. The late, lamented chanteuse Mary Cleere Haran. Married jazz cats Jessica Molaskey and John Pizzarelli. Once saw Skitch Henderson in the audience. My chances of catching further legends are gone. 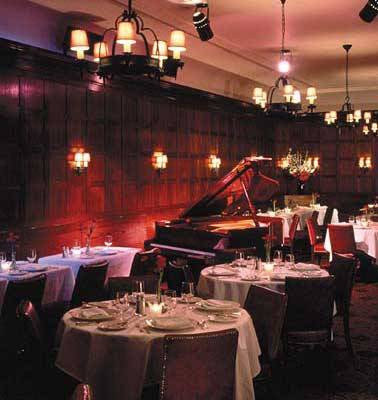 The New York Times reports that "After a 32-year run the Oak Room, the fabled supper club and cabaret at the Algonquin Hotel on West 44th Street in Manhattan, will no longer operate when the hotel reopens in May after an extensive renovation, the Algonquin’s general manager, Gary J. Budge, announced on Thursday. He cited declining audiences in spite of 'top-notch performers.'" Gary J. Budge. What a name. Sounds like the husband of the New Yorker's famed Old Lady from Dubuque (a creation of New Yorker Harold Ross, who used to hang at the Algonquin). Even though it was renovated just four years ago, the Algonquin has been undergoing another extensive renovation since the start of 2012. A year or so ago, the hotel joined the Marriott network's "Autograph Collection." We're to expect "some exciting changes to our guest rooms and lobby." If the closing of the Oak Room is one of those exciting changes, I dread to discover what they're doing with the rest of the lobby. The Oak Room began as the Oak Room Supper Club in the 1930s. It closed down when WWII broke out. It didn't reopen until 1980. 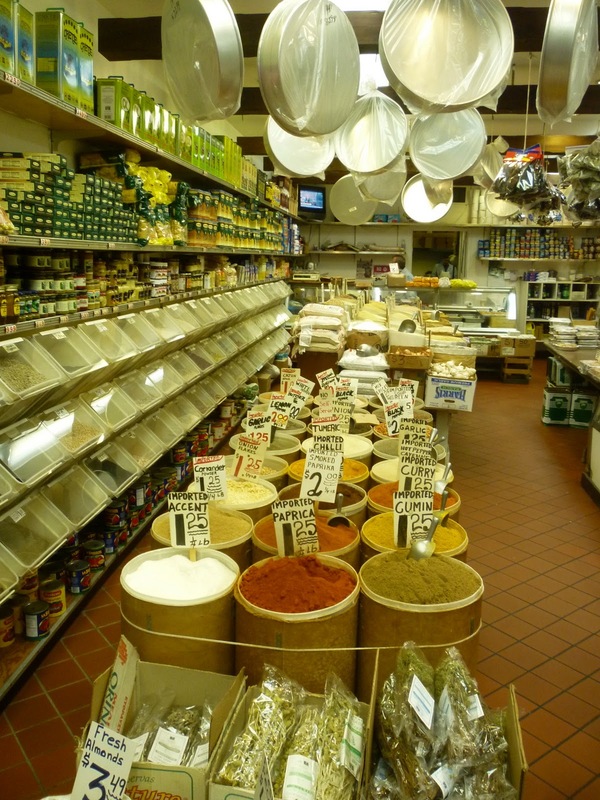 Whenever I'm on the Hell's Kitchen stretch of Ninth Avenue that runs below 42nd Street—a strip that still features a good number of culinary treasures, such as the Esposito Pork Store and the Manganaro Groceria—I try to find an excuse to stop into International Foods, a small spice and dry goods shop with a very grand name. In the current foodie wonderland that New York has become, the store's wide array of imported spices, grains, beans, coffee, olives, nuts and whatnot may not be as unusual as it was, say, ten or 15 years ago. Still, it's pretty damn impressive. Sacks of wonderful-smelling, exotic goods sit it rows on the floor, and the walls are lined with jars and plastic bins of still more marvelous foodstuffs. The store is owned by the two Karamouzis brothers. The family opened the store in 1970, but it looks like its been in business since 1900. You may indeed by served by one of the brothers, dressed in a white jacket and somewhat impatiently awaiting your request. (Don't serve yourself; let them do the scooping.) Prices are amazingly cheap and everything is fresh. I got a pound each of black peppercorns, basmati rice and dried cannellini beans, all for about $5.